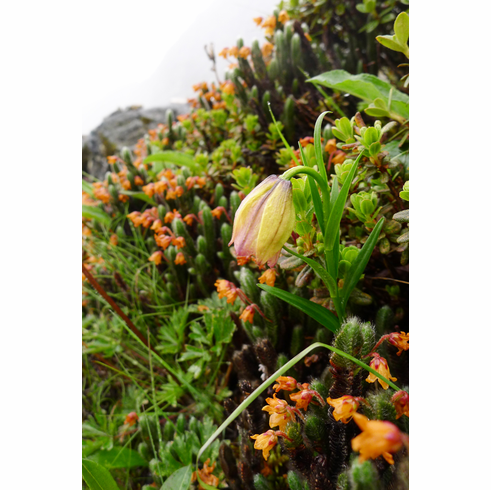 This is a stunning little mountain gem found at about 13,000 feet has perfectly adapted itself to its cold and moist habitat. This is one lily that should be admired in its native habitat among the native dwarf rhododendrons as in "captivity" it most likely will die. I (Bob) have to admit that the evening this photo showed up on my computer for this site, my entire body started to tremble with excitement. Yijia Wang does offer seed of several Chinese Alpines at his nursery as www.canursery.com though as of this writing in January of 2019, no seed was being offered of this selection. Photo copyright Yijia Wang, China. All rights reserved. Used with permission.